If you're a walker or a light jogger and are looking for a cheap yet decent quality treadmill, you should definitely take a look at Proform Crosswalk 500. While the rule about <$1000 treadmills not being the best choice for runners is still true today, the quality of lower end treadmills has been constantly improving over the years, and Proform Crosswalk 500 is a perfect example. Compared to it's counterparts from just a few years ago, Proform Crosswalk 500 offers very good value for money - treadmill with a 2.75hp motor and a 20x55 deck for only $500 is a great deal. In addition, this treadmill also sports a few nifty features designed to improve the quality of your exercising, such as upper body workout handles and an "Interactive Audio CrossTrainer", an audio-visual program which guides you through your workout. All in all, if you're planning to get a machine for around $500, Proform Crosswalk 500 should be on the top of your wish list. Patented ProFlex� isolator cushioning provides reduced impact on your joints. Motivational RaceTrack� and Interactive Audio CrossTrainer� display your workout progress and guide you through an efficient workout routine. Clear and readable display with an 180� viewing angle for improved readability. Built-in fan for comfortable exercising. Dual-Grip EKG� Heart Rate Monitor helps you pace your workouts according to your heart rate. 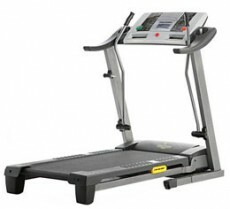 Do you have any experiences with Proform Crosswalk 500 or any other treadmill ? Help your fellow exercisers by writing a short review about your machine.